Since its inception in 1973, AC/DC has been offering up three-chord rock ’n’ roll songs that pair well with sequels to blockbuster superhero franchises. With the announcement of its fifteenth studio album, Rock Or Bust, due out December 2, the band will tap into another market full of hulking beasts and inhuman-like feats: Major League Baseball. The first single from Rock Or Bust is “Play Ball,” which is already being teased out in promotional items for baseball’s upcoming post-season. Notably, the album will also be the first in the band‘s discography to not feature founding guitarist Malcolm Young, whose health concerns following a stroke he suffered this past April have lead to his departure from the band. As a replacement for Young, the band is bringing in his nephew Stephen, who will now be playing along side his other uncle, the still-schoolboy-uniform-clad Angus Young. 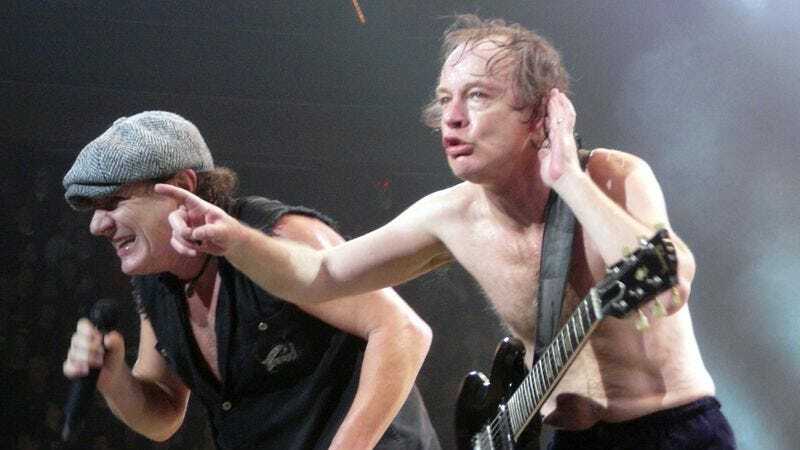 AC/DC will also embark on a tour in 2015 in support of Rock Or Bust, its first since the Black Ice World Tour that kicked off in 2008 and ran for two years, making AC/DC one of the world’s highest-grossing live acts. Dates for the tour have yet to be announced, but it will surely take the band to every locale that is adequately prepared to rock, and only slightly less prepared to watch a 59-year-old man duck-walk across a stage in a schoolboy costume.